Adolescent Dating Violence: Theory, Research, and Prevention summarizes the course, risk/protective factors, consequences and treatment/prevention of adolescent dating violence. Dating violence is defined as physical, sexual, psychological, and cyber behavior meant to cause emotional, physical, or social harm to a current or former intimate partner. The book discusses research design and measurement in the field, focuses on the recent influx of longitudinal studies, and examines prevention and intervention initiatives. 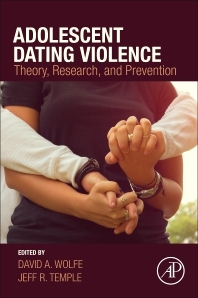 Divided into five sections, the book begins by reviewing theory on and consequences of dating violence. Section II discusses risk factors and protective factors such as peer influences, substance use, and past exposure to violence in the family of origin. Section III discusses how social and cultural factors can influence teen dating violence, addressing the prevalence of dating violence among different ethnicities and among LGBTQ teens, and the influence of social media. Section IV discusses recent research priorities including gender inequality, measurement, psychological abuse, and the dual nature of dating violence during adolescence. Section V reviews evidence-based practice for treatment and prevention across various age groups and settings. 6. Substance Use and Adolescent Dating Violence: How Strong is the Link?